Why Do Jamaicans Run So Fast , the documentary film by Spanish/Jamaican company Nice Time Productions on the triumphs of Jamaica’s Beijing Olympic athletes, has triumphed over 120 entries to win the Garland of Honour in the category of “Olympic Spirit” at the 2009 Movies, Sports & TV Film Festival in Milan, Italy. Shirley Hanna, executive director of Nice Time Productions, told Splash that she received the news on Wednesday, from producer Fernando Garcia and director Miguel Galofre, who attended in person to receive the gold award. Why Do Jamaicans Run So Fast highlights footage of all the six Beijing Olympic Gold medal victories, as well as interviews with the medal winners at home in Jamaica, features of the communities in which they live and comments from leading Jamaicans. A reggae music soundtrack completes the joyous feel of the documentary. The film received applause and acclaim when it was premiered in February 2009 at the CPTC as part of the scaled-down Reggae Film Festival, and it was later selected as the opening night feature of the Kingston On The Edge arts week. In September the film was one of the top three winners in the Best Documentary category of the American Black Film Festival held in Miami, Florida. 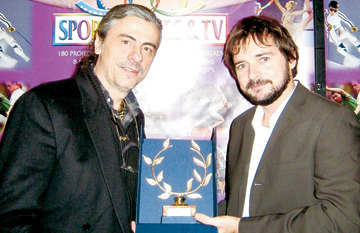 The Milano Sports & TV Film Festival included entries from the world’s leading sports TV stations and film makers.